It would be hard to top the striper fishing that is happening right now from the southern New Jersey ports. It was true no-brainer striper fishing and for us and just about every boat out there today. All it took this morning was to let out let about 100-150 feet of spectra with just about any kind of swimming plug and bang two and three on at a time. Bombers, Stretches, Rapala X Raps all worked great today in various different colors. It mattered little if we trolled at 2.5 knots or 3.5 knots as we kept getting 2 and 3 hits on every drop back pretty much. We had at least 20 stripers overall this morning and had our legal limit by about 9:30 am today all within the 3 mile line. There is no doubt poppers would have worked well today also. 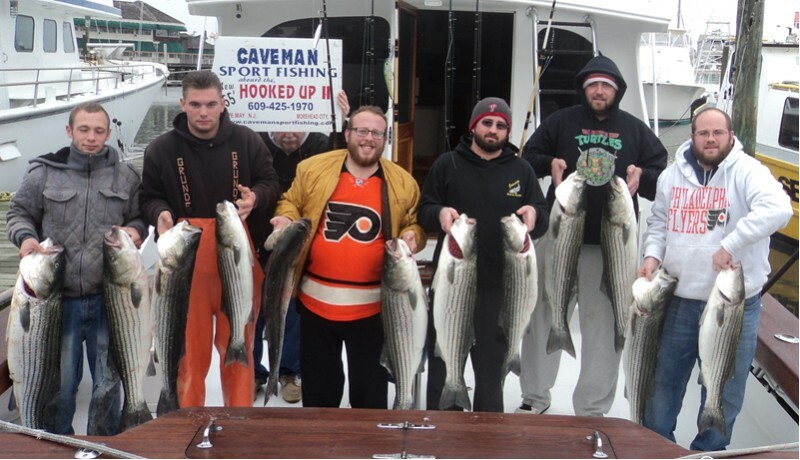 Nice quality fish and it was without doubt some the best striper fishing on Hooked Up II since last fall. As I mentioned the boats around us limited out as well as the fishing today was nothing short of great. Love fishing weekdays compared to weekends. Today’s was a bit nasty, but the fishing was just fantastic. We may run an open boat on Saturday and do have 2 dates of dates open next week for anyone that would like to get in on this bite.